There are thousands of professional WordPress themes available to choose from, but even with all that choice you often find that you would like to make minor changes to your chosen theme. Fortunately armed with a little understanding of PHP, CSS and WordPress templates you can easily modify the appearance, and add extra functionality to your theme. 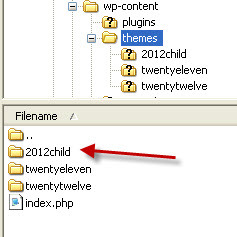 To illustrate this we are going to modify/customise the default 2012 theme so that. Header 2 tags are red and very large. The quick and easy way to test it is to simply edit the theme style sheet (style.css). The recommended method is to create a child theme. A child theme has the advantage that any changes you make aren’t overwritten when the parent theme gets updated. Upload the directory to the theme directory on your site. 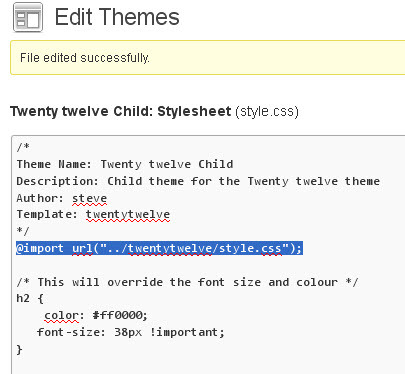 The only file required in a child theme is the style.css file, and this should contain a correctly formatted header. You can change the lines to suit your theme. 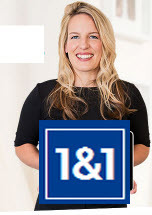 The required lines are the Theme Name, and the Template. It is usual to import the existing style sheet from the parent theme as you are only going to make minor changes, and not create a totally new style sheet. Note: I am using the default twenty twelve style sheet in this example. Here is a video showing how to modify the theme using both methods. A- The theme will be updated as normal and will not affect your child theme. The child theme settings will apply to the upgraded theme. A Common task as to add copyright notices to the bottom of your WordPress posts/pages or add a newsletter sign up form etc. To do this you will need to make changes to the header and footer files. This we cover in editing WordPress Header and Footer files.